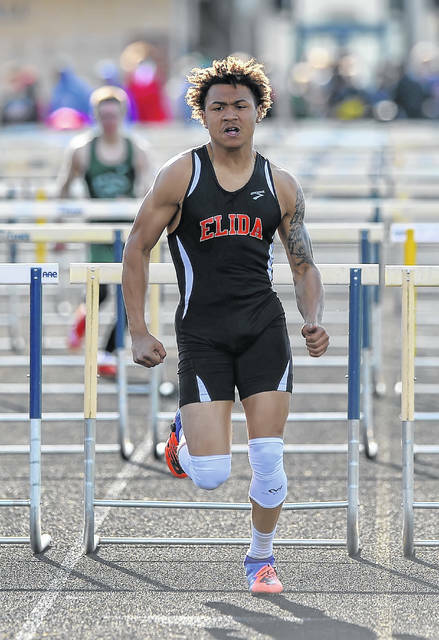 Elida’s KeShawn Spivey competes in the 110-meter hurdles during Friday night’s Ottawa-Glandorf Gold Medal Track and Field Meet. 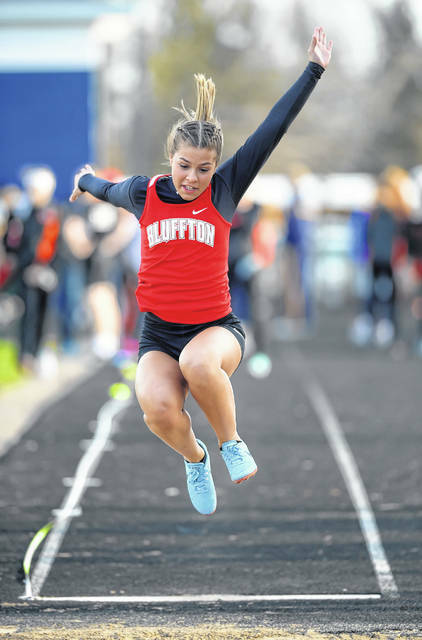 Bluffton’s Bella Basinger competes in the long jump during Friday night’s Ottawa-Glandorf Gold Medal Track and Field Meet. 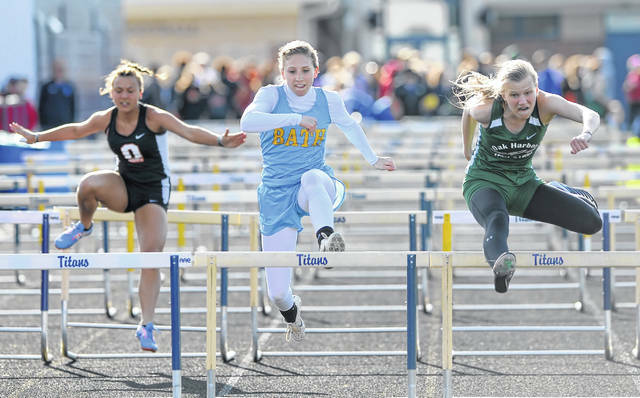 Bath’s Caitlyn Renner, center, battles Oak Harbor’s Amelia Mizelle, right, and Otsego’s Sidney McCoy in the 100-meter hurdles during Friday night’s Ottawa-Glandorf Gold Medal Track and Field Meet. Ottawa-Glandorf’s Gavin Hedrick, center, leads the way in the 110-meter hurdles against Van Buren’s Kyle Hoying, left, and Liberty-Benton’s Michael Kotey during Friday night’s Ottawa-Glandorf Gold Medal Track and Field Meet. 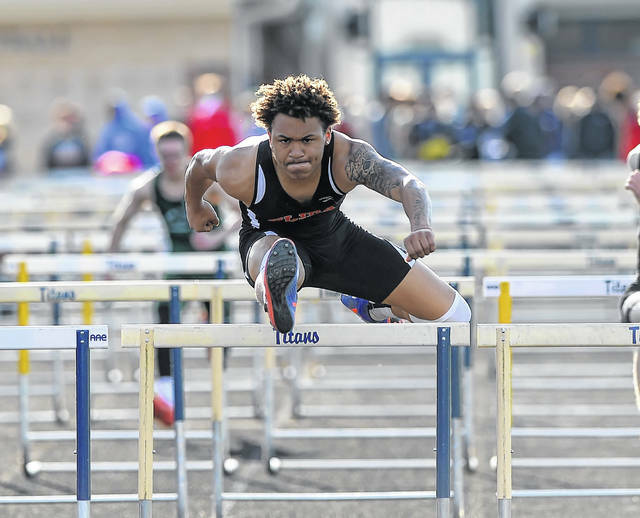 OTTAWA-GLANDORF — Last spring, Elida’s dynamic duo of Xavier Gilkey and KeShawn Spivey, hurdled past the competition. Both Gilkey and Spivey made it to the Division II state track-and-field meet at Ohio State in the hurdles. At last year’s state meet, Gilkey placed sixth in the 300-meter hurdles. Spivey, a sophomore at the time, made it to the state meet in the 110-meter hurdles, but did not make the finals. This season, there’s a little different feel around the Elida program. Gilkey graduated and has moved on to the University of Saint Francis (Indiana). Spivey, now a junior, is carrying the load for the Bulldogs in the hurdle events. However, that’s obviously not an issue. Spivey spring boarded to this spring track season by winning the 60-meter hurdles at the state indoor meet in early March. Now, Spivey has his sights set on making it back to the outdoor state meet, come the first weekend in June. 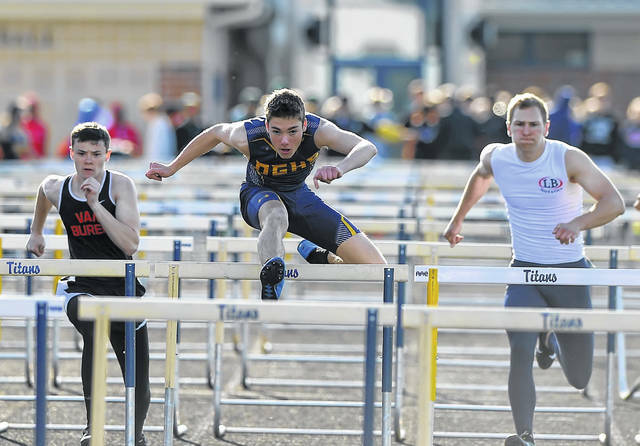 At Friday’s 54th annual Ottawa-Glandorf Gold Medal Track and Field Meet, Spivey won the 110 hurdles (14.96 seconds) and placed second in the 300 hurdles (43.16). Spivey, also a football standout, gives Gilkey a great deal of credit for his success. Spivey competes in both the 110- and 300-meter hurdles. However, he does have a preference. His all-time personal best in the 110 hurdles is 14.9 seconds. Spivey’s experience at last year’s state outdoor meet has inspired him. Oak Harbor won the boys’ and girls’ team titles. There were 11 schools at the meet. In the boys’ 3,200 meter run, Van Wert senior Gage Chiles won in a personal-best time of 10 minutes, 15.14 seconds. In the throws, the Van Wert siblings, Austin Clay and Kirsten Clay, scored big points for the Cougars. Austin won the shot put with a mark of 57 feet, 7 inches. He then finished second in the discus with a toss of 154-8. Kirsten Clay won the discus with a mark of 137-2 ½. Clay finished second in the shot put to teammate Jill Gemmer. Gemmer won with a put of 38-5 ¼. Clay’s best put was 37-7 ¼. This entry was tagged Elida. Bookmark the permalink.